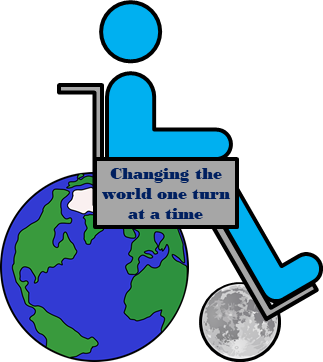 Wheelchair clip art with a symbolized earth and moon as the wheels. An Allegory of changing the world to the better, and an illustration of the work of Omron taiyo in employing handicapped workers. Earth and Moon by Clker-Free-Vector-Images from Pixabay in Public domain, remaining image by me also released in public domain, although an attribution would be appreciated.